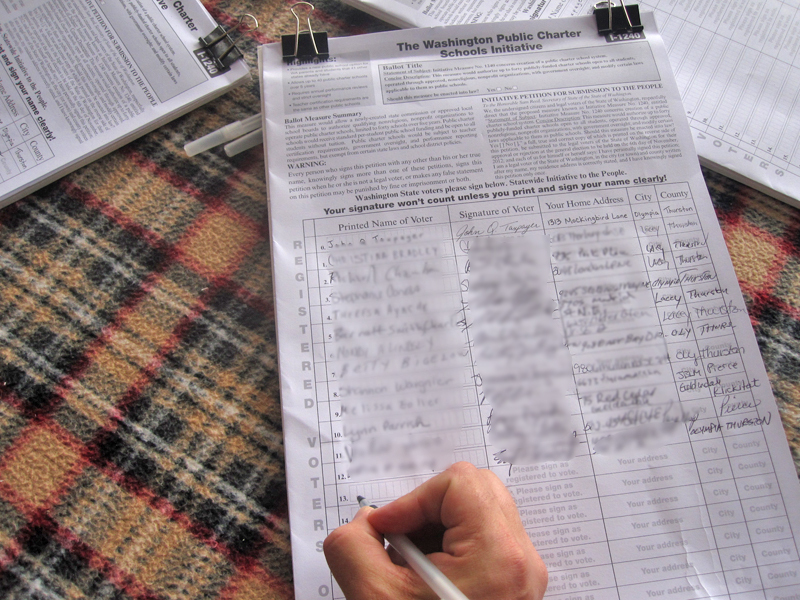 Spotted Sunday at the Lacey Wal-Mart: A petition sheet for I-1240, demonstrating that the signature-gathering campaign is off and running. OLYMPIA, June 15.—A Thurston County Superior Court judge fired the starting gun Friday in this year’s big initiative race – a breakneck 21-day effort to gather some 300,000 signatures for Initiative 1240, a measure that would permit charter schools to be established for the first time in Washington state. Thurston County Superior Court Judge Lisa Sutton made a few minor changes to a ballot title that had been written by the state attorney general’s office, but she rejected a request from the Washington Education Association to phrase it in a negative light. So much for the last preliminary step. The starting gate opened at noon. And by late in the day the ed reformers behind this year’s effort had pressed the green button on the printing presses and were churning out petitions at full speed. If they make it, it’s going to be one of the fastest qualifying times in state history. It also is likely to be one of Washington’s most expensive signature-gathering campaigns. There are just three weeks to go before July 6, when initiative campaigns must turn in 241,153 valid signatures – and usually a bit more than that to be on the safe side. Only one other initiative has qualified in that short a time. That was last year’s Initiative 1183, the measure that brought booze to supermarkets, which also qualified in exactly 21 days. One reason to think it might work again is that the signature gathering effort is being overseen by the same campaign consulting firm, Winner & Mandabach of Santa Monica, Calif., which makes a specialty of big-buck initiative drives. If last year’s experience is any indication, it might cost as much as $2 million for the signature-gathering alone. But this is one campaign that might be able to pay the freight. An interesting name turned up on the list of campaign contributors this week when the May campaign-finance reports were turned in at the state Public Disclosure Commission. Bill Gates, America’s richest man. The measure would allow as many as 40 private non-profit charter schools to be established, financed by public dollars that follow the student. It would allow no more than eight schools to be established each year for the next five years, and they would be subject to review by a state board. Their performance would be strictly monitored. Washington would become the 41st state to allow the alternative schools to be established – some 5,000 have been launched nationwide, and President Obama is a supporter: Last month he proclaimed National Charter Schools Week. But in this state charter-school measures have been beaten at the statehouse largely because of the stiff opposition of the state’s dominant teachers’ union, the WEA, and its Democratic allies in the Legislature. A renewed effort this year by business groups and education reformers was beaten in the House and Senate education committees when chairwomen Sharon Tomiko-Santos and Rosemary McAuliffe refused to allow their members to take a vote. Charter school measures have appeared on the ballot three times since 1996, but have been defeated each time. At this point the full coalition that promoted the bill in the Legislature has not yet regrouped – that’s because the Washington Roundtable, an association of the state’s largest businesses, has yet to take a formal stand. But numerous lawmakers who backed this year’s charter school bill have offered their endorsements. Sponsoring organizations include Campion’s organization and the League of Education Voters, together with a newly formed organization in this state, Democrats for Education Reform. The campaign finance reports offer a further clue as to support. By the end of May the campaign had raised $386,000, most of it from three donors. The largest contributor was Gates, at $253,000. Also backing the campaign was Seattle venture capitalist Nick Hanauer, with $25,000, and Katherine Binder, president and CEO of EMFCO Holdings, at $100,000. Ballot title challenges can be taken two ways. They might reflect dissatisfaction with the way the state attorney general’s office chooses to summarize a ballot measure. But even if they provide a fair statement of the issue, a lawsuit certainly delays the date by which an initiative can hit the street. On I-1240, sponsors made a preemptive strike by suing to challenge a pair of innocuous words in the proposed title. That established a hearing would be held Friday. And then, as might have been expected, WEA filed a challenge of its own on Thursday, the final day on which challenges were permitted. But because a hearing was already set, its suit was combined with the other and the hearings were held concurrently. It was a strategy that saved perhaps a week. You can count on a battle if the measure makes the ballot. WEA’s executive board already has voted to oppose the initiative. And that introduces a big wrinkle into this year’s campaign. It may not be easy for the union to match Bill Gates dollar for dollar, and every dollar the union spends in an effort to defeat the initiative is a dollar it can’t spend on this year’s gubernatorial race or legislative races, where it is traditionally a major player. Decisions about campaign spending are premature, observed WEA spokesman Rich Wood – the initiative hasn’t made the ballot yet. “Statement of Subject: Initiative Measure No. 1240 concerns creation of a public charter schools system.